Great Album Review for Shanna Jackman! NewSong International Region ‘People’s Choice’ Winner! It is official. 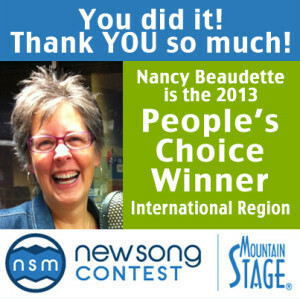 Nancy is the “People’s Choice” Winner in the International Region of the Mountain Stage NewSong Contest. There are six regions (the other five throughout the U.S.), each with ten finalists. Nancy placed 4th overall in the popular vote. Mountain Stage NewSong Contest: Now in its tenth year, it’s one of North America’s premier showcases of emerging performing songwriters across the United States, Canada and Internationally. Congratulations to Victoria and all the Regional Winners! Thank you to everyone of Nancy’s friends and fans who voted and showed their support.